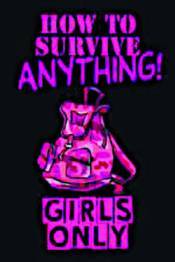 Unlike those other books for girls that are a little too daring, Girls Only: How To Survive Anything is the perfect guide. In addition to the mix of humor and helpfulness, the fresh graphic style of art makes this book stand out from all the others. With practical, funny, and sometimes ridiculous how-tos (like how to deal with a clothes crisis, teach your cat to sit, and spot an alien in your family) girls are going to love getting prepared for just about anything!